Henna tattoos are an ancient custom in India: girls and women are body painted before ceremonies, like marriage. They painted complicated patterns on their hands and feet to symbolize their fertility. Henna (or 'Mehndi', the Indian name) is made from the henna plant (Lawsonia Inermis). The leaves of the plant are dried and ground. The powder gets mixed with water and you get a sort of green-brownish mud. If you put that mud on your skin, let it harden, and then peel it off, you will notice it has left an orange color. You can get your henna at an eastern shop or a 'souk' in many different colors. There's orange, mahogany, brown and black. The orange one is the traditional henna. The black henna is synthetic. It contains PDD (P-phenylenediamene) and can cause allergic reactions. Even if it doesn't cause irritations, it's still unhealthy. 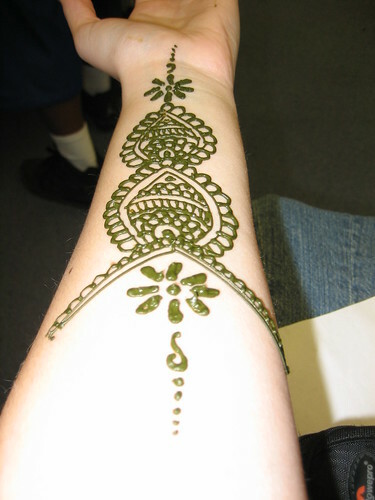 Moreover, in the past, black henna at your wedding was considered a disgrace. With one pack of henna, you'll have enough to body paint the entire football team. Put the henna in a bowl and gently pour some lemon juice and boiling water in the bowl. Don't use too much water, the mud has to resemble the thickness of sate sauce. The purpose of the lemon juice is to help the color hold better on your skin. Your skin should be clean, dry and not fat. If you want to color your nails too, they shouldn't have nail polish on them. Make sure you really want this, because your nails will be orange for about 2 months. It doesn't come off! When the henna is cold, you can get to painting. If you want to paint your foot soles, which is a traditional custom in Marokko, make sure you have a pillow of some kind to keep your feet off the floor, before you know it, the henna mud is everywhere! You can apply the henna with all sorts of instruments, what works best is a syringe (without the needle of course). Symmetric and geometric shapes work best. Don't make the lines too thin, the color won't come on to your skin very well. The bigger the surface, the brighter the color will be. Let the henna dry in the sun, the warmth of the sun will get your color deeper into your skin. You can also use a hairdryer. If you make a mistake in the picture your painting: ACT QUICKLY! If you wipe it off too late, the henna will leave a red spot. After a while, the henna will start to burst. Don't peel it off yet! The henna has to stay on for at least two hours. Then you can start removing the crusts of mud. DON'T remove the henna with water! Just scrape the crusts of your skin, you can do this with a bold knife. Don't let your body painting get in touch with water for the first couple of hours. Right after you scraped off all the crusts, rub your skin in with olive oil. It will make the color brighter and help keep the color on as long as possible. Your henna painting will survive for about a month or so. Also nice to know: Swimming, body peeling, scrubbing your back, and bodyscrub products will make the henna tattoo deteriorate faster.